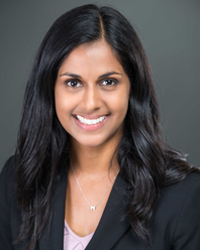 Dr. Amin completed her residency in Obstetrics and Gynecology at the University of California, Irvine, where she was given the ARISE star performer award for exemplifying academic achievement, respect, integrity, service, and excellence as a physician. This was followed by a three-year fellowship specializing in Reproductive Endocrinology and Infertility at the UCLA Medical Center. Dr. Amin has written numerous scientific journal articles and book chapters for leading medical journals and textbooks. She has been a presenter at many national meetings, including the American Society for Reproductive Medicine (ASRM) and the Western Association of Gynecologic Oncologists (WAGO). Dr. Amin is committed to helping her patients achieve the joys of parenthood. She lives in Long Beach with her husband and daughter and in her spare time enjoys traveling, gourmet food, and spending time with her family. The University of Vermont College of Medicine, M.D.